While RUBY SINGS has made its name hosting acoustic nights and unsigned showcases every 2nd and 4th Tuesday of each month, the RUBY SINGS JAM has taken on a life of it’s own. Widely appreciated, the RUBY SINGS JAM has become a magnet for singers and musicians on the UK circuit and beyond, providing the perfect mid-week anecdote for the faithful - music and cocktail lovers alike! Think soul beats and pop hooks, chart classics from Stevie Wonder’s ‘Superstition’ and Jocelyn Brown’s ‘Somebody Else’s Guy’ to current hits like Frank Ocean’s ‘Ivy’. How does it work? Put simply, the RUBY SINGS JAM is a back-to-basics style jam session. Turn up, choose a song (yes, any song), and put your name on the list! Whilst we retain our rhythm and blues/pop and soulful roots, our jam session embraces every genre from jazz and hip hop to techno. Welcoming all vocalists, musicians and happy people of any level, we invite you sing and/or play, or even just ‘handclap it’ alongside our house band, a hotchpotch of ridiculously talented musicians whose vast repertoire remains varied and flexible, guaranteeing a strong and loyal crowd. Comprising of UK session musicians (no less) our house band otherwise play for established UK artists. As such, we’ve already enjoyed impromptu performances from Daley, Emelie Sandi, Lianne La Havas and Roy Hargrove, to name but a few… Who knows who will be next to grace the RUBY SINGS stage! The RUBY SINGS JAM takes place EVERY TUESDAY at our little atmospheric bar in the heart of Soho, upstairs at Ronnie Scott’s! 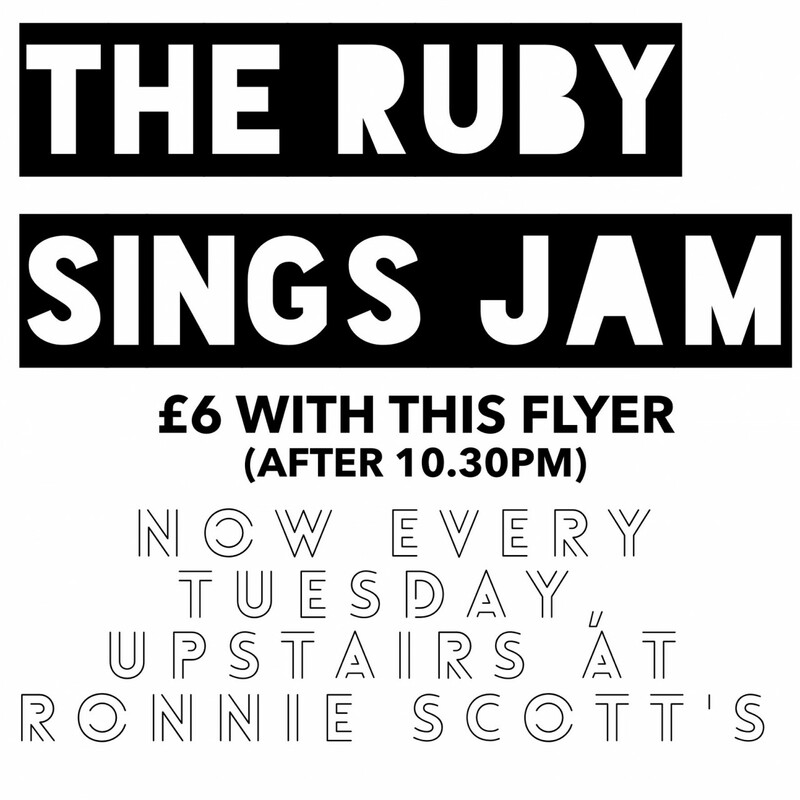 Tell us what you think of The RUBY SINGS Jam - weekly jam sessions, upstairs at Ronnie Scott's below..